Hyperlite Mountain Gear is a fairly young cottage manufacturer from the USA, with some very innovative cuben tarps and packs and a great looking and very user friendly website. I managed to get in touch with Mike, the founder of HMG, and he took the time to answer my questions in order for us to get to know Hyperlite Mountain Gear a bit better. It is a great interview and I enjoyed reading Mike's answers and stories heaps, and I hope you do as well - Enjoy! Mike on a river bank at sunset, with the Windrider I backpack. Mike, please briefly introduce yourself and tell us who you are. Since when are you backpacking, and how did you start? How often are you out backpacking nowadays? My name is Mike St. Pierre and I am the founder and ceo of Hyperlite Mountain Gear. I have always loved the outdoors and was introduced to backpacking about 12 years ago by a close family friend while I was living in Boulder, Colorado. I still remember that first trip. It was a great experience even though there was nothing lightweight about it. I still remember everything that we packed into our bags… including the kitchen sink. But I loved it - I loved being outdoors, I loved the mountains and the fresh air, and I loved the sense of accomplishment and freedom I felt by the end of that trip. A lot has changed since my initiation to the Rocky Mountains. About five or six years ago I started to really think about what I was putting into my pack. I began weighing my gear and building spread sheets to help organize everything. It seems that this is how most participants get into lightweight because it works. In the process, I managed to get my base pack weight from 50lbs down to 20lbs. Shortly after this “down-sizing”, I built and began carrying my first tarp shelter and have since evolved to a base pack weight of 7-10 lbs, depending on the trip. Nowadays, I’m spending most of my time building the Hyperlite Mountain Gear business, but you can still find me bouncing around in the White Mountains on the weekends. They are conveniently close to my home and I will usually head out Friday night with some friends or even solo, get to the trail head around sunset, hike until midnight or so, and then make camp for the night. Saturday mornings, I’m up early, have coffee and a little breakfast and head out for what is usually a 20 + mile day in the mountains. My Sunday schedules are pretty much like my Saturdays except that I try to get out of the woods before dark to get home and relax before the start of the new week. I usually cover about 40 miles, give or take, on these weekend trips. I am an ultralight backpacker and my base weight averages between 7 and 10 lbs. This number seems to keep me the most comfortable in a variety of 3 season situations. And with such little weight, I can really move out there in the wilderness. Mike at the design table at the HMG Shop. Please tell us where the name "Hyperlite Mountain Gear" comes from, and what it stands for. The name for our company came from a brainstorming session. I knew that I wanted to build durable and innovative ultralight products, so we racked our heads together, tossing around name ideas that would be indicative of our goals. To me, the word hyperlite is an innovation and evolution on the lightweight and ultralight concept. So I feel that “Hyperlite” represents innovation while “Mountain Gear” represents the durability and toughness that we also stand for. Put the two together and there you have it – durable, innovative, ultralight outdoor gear. Hyperlite Mountain Gear is a relatively young cottage business, you started out just a few months ago. Can you tell us how the idea to start the company emerged, if it was easy to quit your previous job and how you see the future of the company? The idea of the company started almost four years ago when I was reducing my pack weights and found that there were such limited options available on the market. I had been dabbling with making my own gear, but nothing really came of if, in terms of becoming a business, until 2009. That summer, I was living in Brooklyn, NY and working as a chef. The hours were long and every chance I got, I would drive up to the Adirondacks in NY for a short backpacking trip. I had just recently built the first prototype of the Echo I shelter and was using it regularly. It was sewn on a cheap $100 household machine, and let’s just say the product was usable but incredibly far from where we are now. I was carrying base weights of about 10 pounds on those weekend trips and I was really starting to see the benefits of Cuben Fiber gear. The idea of this becoming an actual business became even more apparent on one trip to the Adirondacks when I was stopped by a forest ranger who asked where I was going. I had planned a 50 mile trip for the weekend and when I started to tell the ranger where I was heading, she wouldn’t believe me. The first thing she asked was if I had a sleeping bag in my pack. “Of course I have a sleeping bag,” I said. But I must not have been very convincing because I had to empty everything in my pack to show her I had enough gear to safely complete a three day trip. She was a bit dumbfounded as she allowed me to continue on, in disbelief that I could carry so much gear in such a little pack. I could tell she was thinking about her own gear because her day bag was much bigger than my weekend pack. Mike and his brother Dan on the summit of Mt. Washington. I had another experience like this in the White Mountains of New Hampshire, followed by a few more encouraging encounters with fellow hikers. That’s when I started to think that this could really be something. Most of these people really loved the idea of what I was doing, and loved the idea of going light, but they had very little knowledge of how to do it. These experiences had a big effect on me and eventually convinced me to start the ultralight gear company that is now Hyperlite Mountain Gear. By the way, I love cooking, but I love being in the outdoors more. So leaving a job for something you love is not that difficult, particularly if you believe in what you’re doing. I really believe in the ultralight philosophy and I really believe in Hyperlite Mountain Gear. You offer some very lightweight gear, like the ECHO I Tarp and the WINDRIDER I Pack, can you tell us a bit how HMG went about the design process of these two pieces? I very much enjoy camping with a tarp and have been using them for years due to their versatility. There are just so many things you can do. Prior to building my waterproof Windrider pack, I’ve used tarps as pack covers, shelters, a blanket, and rain gear. I’ve used tarps to close off the open side of three-sided shelters, and I’ve even used them to collect rain for drinking water. To me it’s an invaluable piece of gear. With that in mind, I wanted to create something even more innovative and versatile. I wanted to create a tool which could be used in a variety of situations and fulfill a variety of needs given the weather, the situation, or camp site selected. So we went about trying to create the lightest, most durable shelter available using a tarp. A ton of work went into our Echo Systems. We started with the tarp and literally made one hundred of these before arriving at what it is today. And living the learning curve and watching the product evolve was amazing. 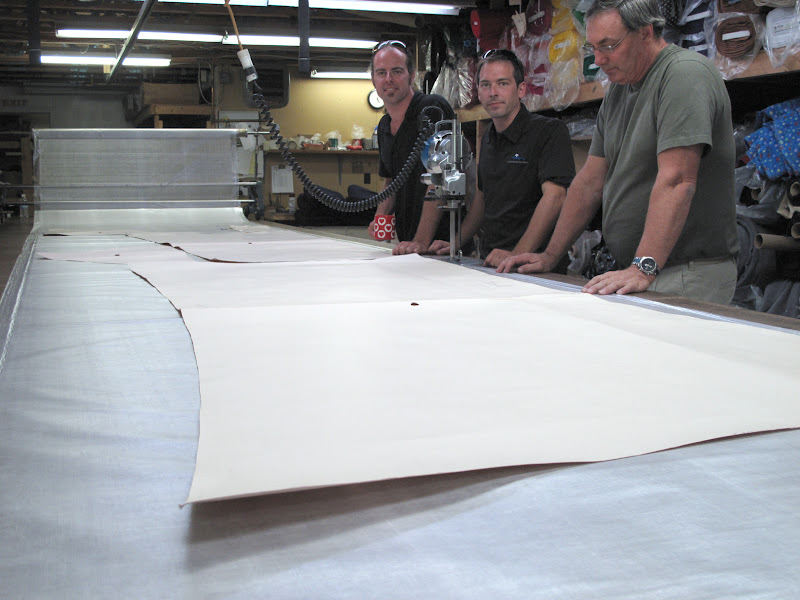 We are grateful and feel fortunate to have met and received some help from local sailmakers in Freeport, Maine. 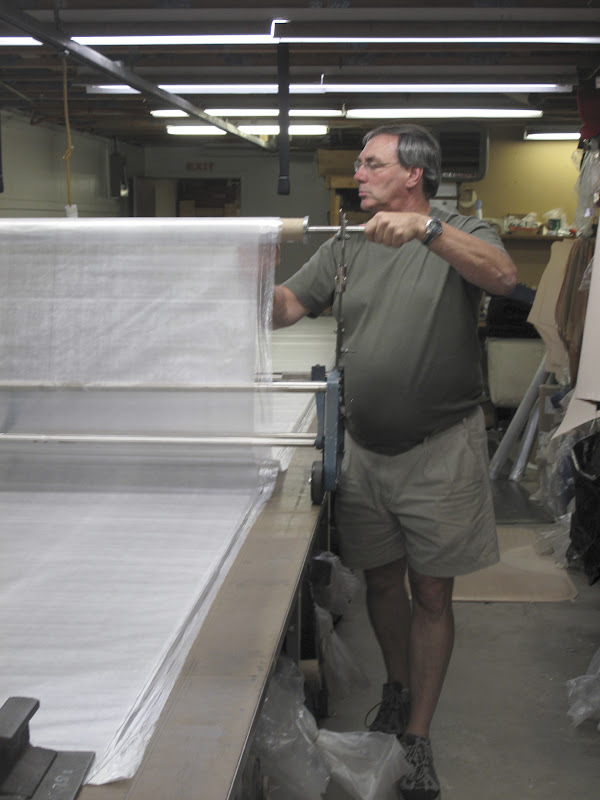 There is a big boat building and sailing tradition in Maine and some of these guys had already been working with Cuben fiber for a few years. They shared a lot of information with us about cutting, taping, sewing, UV degradation and the overall handling of the Cuben fiber material. They really accelerated our climb of the Cuben fiber learning curve and within a few months, we had a new working prototype of the Echo I.
Mike and Rich at the design table. Around this time we had another stroke of luck and met Rich Page, who is now our lead product designer. Rich has been in the business for over thirty years and he really helped us bring the Echo shelters to the next level. He’s taught us some of the design tricks he’s learned over the years, and he’s been critical in helping us achieve our goal of making the lightest, most durable tarp shelter available. And our shelters are extremely light; not the absolute lightest on the market, but more durable than any comparable product. As far as the Windrider ultralight pack, the design phase was much quicker. Rich has been designing and making packs for a long time - And he’s good at it. Our first prototype was made shortly after we met him and many versions were tested hard on the Appalachian and Pacific Crest Trails. The feedback was critical. Thirty or forty changes were made over about 7,000 miles of field testing, and we now have a rock-solid (some customers have even said bulletproof), 1.50 lb ultralight pack. We love to be let in on the work-in-progress stuff! Can you let us know what kind of new products you're working on the moment? Given how new we are to the ultralight scene, we are trying not to get ahead of ourselves. However, Rich and I spend a lot of time together at the design table and we just can’t help playing around with new ideas. Several new products are on the radar, but our next new actual release will be another pack. It will be similar to the Windrider we now offer, but with different features, such as ice axe loops, redesigned exterior pockets, perhaps a different color, and we are thinking about trying aluminum stays. These changes have all come from the feedback of our customers and product testers on the AT and PCT. Jill sewing bar tackers on the HMG Windrider I.
We’re also playing around with other shelter ideas as well as some cuben fiber apparel with multiple functionality. For example, I have been testing cuben jackets and pants that can be used as my rain gear, my wind gear, and as a vapor barrier in much colder weather. Using these new materials in new applications definitely requires re-climbing the learning curve. And when it comes to non-breathable fabrics, one must always be in tune with the body and conscious about how much heat it is generating. I am learning that even on much cooler days, for example, I can wear a cuben fiber jacket with only one thin long sleeve layer and feel completely warm and dry on the inside. We have a lot of fun with this and we really look forward to what we hope is significant growth and the ability to keep designing and innovating new ultralight outdoor gear. 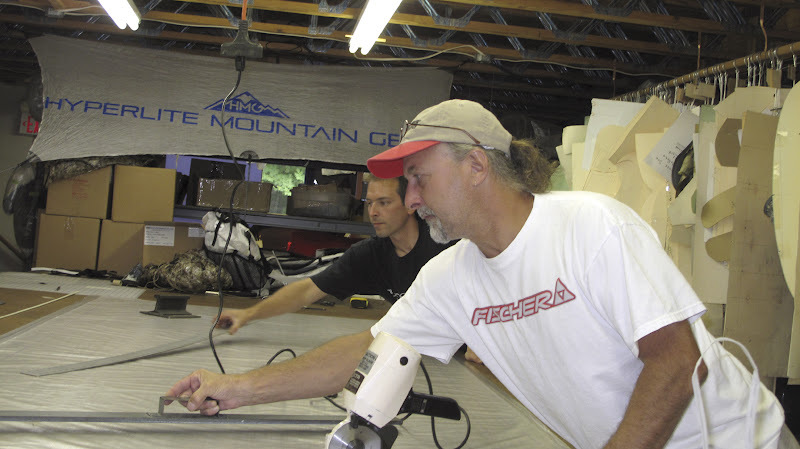 How works the R&D at Hyperlite Mountain Gear, do you have a need yourself that you try to fix, or do some of your clients inspire you for new products and ask you for solutions to their problems? We are still in such an early stage of our development here at Hyperlite Mountain Gear, so to date, we have been building gear that we like to use. We’re also really big on research so that we are not redundant and so that we continue to be innovative on anything we attempt. That being said, we are starting to get feedback from our customers. In the short time since our launch, we have had many queries about our design choices, about other needs that hikers, backpackers and climbers have, and about custom-made products that some potential customers would love to have. Obviously, we cannot fill every single need on the market, but we certainly want to incorporate as much feedback and as much of the customers’ needs into all of our designs going forward. In this day and age, with the level of communication a business can have with its customers and its marketplace, it would be foolish not to listen to the buyers and make products that address the most universal of these needs. What is the Hyperlite Mountain Gear bestseller, and where do your customers come from? Our biggest seller to date is our Windrider ultralight pack. The feedback has been tremendous and we feel it is absolutely justifiable. 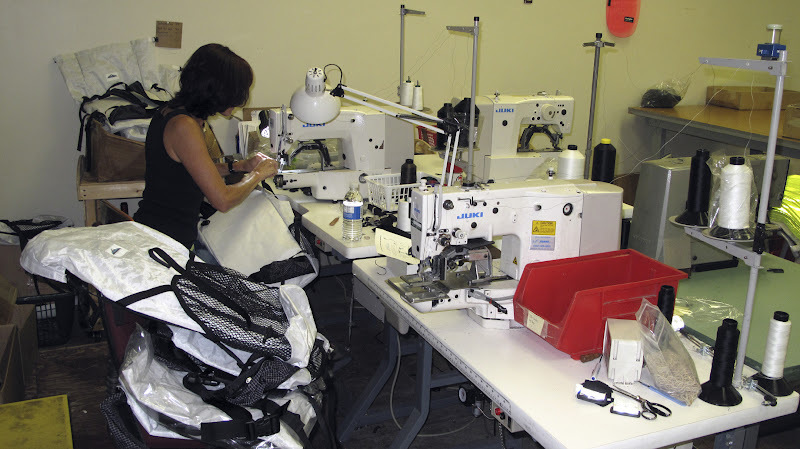 There are many, many years of pack building experience between Rich and our team of stitchers. Plus I am a stickler for good research and taking advantage of user feedback. Our pack is great, and a lot of people have seen them on the AT and the PCT, which has already helped our sales. Our Echo shelters are extremely well-built as well, but less people have seen them out on the trail because the shelters are all packed up during the day while our hikers are hiking. Of course, we are extremely proud of these shelters. Without the Echo I, there would be no Hyperlite Mountain Gear. And we remain confident that as more people learn about us, and our products get reviewed (we currently have several reviews in process), and word gets out on the quality and level of our craftsmanship, all of our products will be successful ones. So far, our customers are all coming from the U.S. but we are getting web hits from Canada, South America, Europe, Japan, New Zealand and Australia. We hope that the positive coverage we are getting from you Hendrik, as well as other blogs, forums and online magazines will be a big help in increasing the global awareness of our company and products. And actually, we just received our first order from Japan, right now as I’m completing this interview! Spreading cuben fibre across the cutting table. Are you in touch with other cottage manufacturers in Europe, the USA, Japan or other places? We are not currently in touch with any other cottage manufacturers, however we were attending one of the U.S. industry’s big trade events called the Outdoor Retailer Show, in Salt Lake City, from August 3-6th. We look forward to introducing ourselves and meeting several of the other American cottage manufacturers during the show. Our attitude is that competition is necessary; great for innovation and great for the customer. But essentially, we’re all on the same team trying to build a new, high-growth segment of the outdoor industry. Currently, my favorite backpack is our own Windrider ultralight pack. It was designed to fit the needs of any backpacking situation, which is what I do the most. Plus I enjoy covering big miles and this pack comfortably allows me to do so. When I’m in the woods and the mountains, it rarely leaves my back, and it fits so nicely that I usually forget I’m wearing it. Other than that, I carry a Neo Air and an appropriate sleeping bag for the season and altitude. And although the HMG shelters have only been on the market for a little over a month, I’ve used nothing else for the past few years. The Echo I Tarp is perfect for me and if the weather permits, it’s all I’ll use. If the weather is questionable, or there are nasty mosquitoes, I’ll clip in the Echo I Insert and am 100% protected. If there are heavy winds or big clouds overhead, I’ll button on the Echo I Beak and I’m snug as a bug. There have been a few instances over the years where I’ve woken up in four or five inches of rain run-off and I’ve always stayed warm and dry. I once even awoke to eight inches of snow and the tight rideline remained taught throughout the night. My new favorite piece of gear is my Cuben fiber anorak jacket and pants. These are still in the testing phase, but it’s been fun experimenting and playing around. I really like them. After the Outdoor Retailer Trade Show in Salt lake City, we are heading out for five days in search of a round-a-bout way to climb Utah’s hightest mountain – King’s Peak. 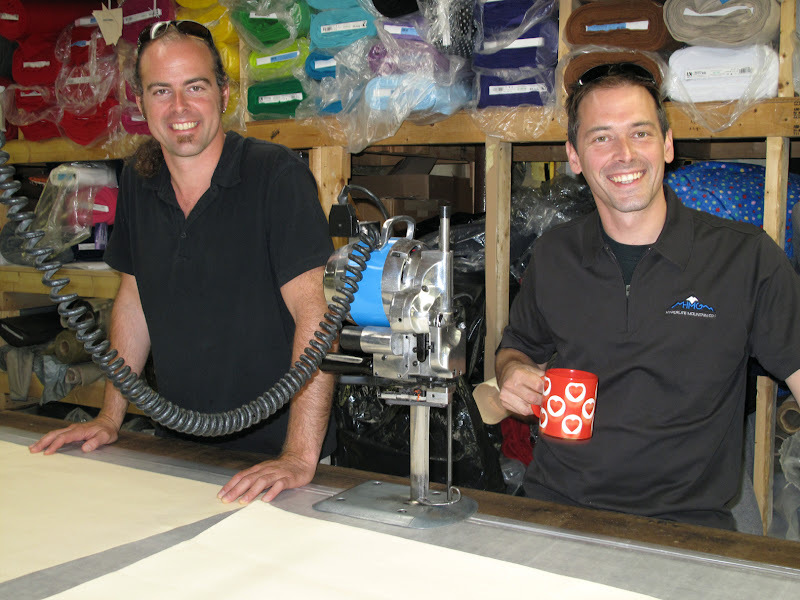 Joining us for the trip will be one of our fabric suppliers and our lead product designer, Rich Page. I will have a total pack weight of 20lbs for the trip including food, fuel, and 1.5L of water to start. Additionally, I’m going to meet our lead product tester, Donald “Bama” Crook, this afternoon in the White Mountains of New Hampshire. “Bama” has been on the Appalachian Trail since May 15, and in 75 days he has hiked almost 1,900 miles with the Windrider pack and the full Echo I system. He has about 300 miles to go and is scheduled to complete his AT hike in the next eleven days. We believe he is on pace to be the third fastest AT hiker this year. This is such a great question that we are so often asked, and I have to say that while it is taking time, I truly believe that lightweight and ultralight are the way of the future for backpackers, hikers, climbers, or really anyone spending time in the outdoors. The lightweight concept has only been around, with any reasonable awareness, for 15 years. And the evolution to the ultralight philosophy has only been in the community’s awareness for the past five years, roughly. All of this takes time to reach critical mass, particularly since mass-market manufacturers and retailers are slow to adopt. But the mass-market players don’t have much incentive to jump onboard until there is mass-market consumer interest. So in the meantime, it is up to the cottage manufacturers, the current lightweight and ultralight enthusiasts and the thought-leaders in this segment of the industry to forge ahead and spread the word. There is big potential opportunity! Lighter and stronger? How can it not catch on? Anyone who has tried it will admit that it is so much more comfortable being fully and safely equipped with 15 lbs of gear instead of 40-50 lbs. The biggest barriers though to ultralight at the moment, are awareness and price. There are multiple-millions of people participating in hiking, backpacking an climbing all over the world each year, yet it is our understanding from both research and experience, that a small percentage even know that ultralight is an option. Plus, the expense associated with such high-tech products does prevent some consumers from embracing the concept. But this is changing. People are becoming more aware, the movement is rapidly gaining ground, and the more it does, the less expensive the products will eventually become. Finally, we are seeing evidence that some mass-market retailers are interested in lightweight products. Some of them now even have very small lightweight sections in their stores. There’s no telling exactly when the lightweight and ultralight philosophies will explode into the awareness of the masses, but I expect it is inevitable. We’ll see what happens. The brothers St. Pierre in the HMG shop. Mike, I thank you for taking the time to answer my questions =) Is there anything else you would like to add? Yes. I would like to thank you Hendrik, both for the opportunity to share our thoughts with your readership and for your work in helping to increase the growing awareness of lightweight and ultralight hiking, backpacking and climbing. Best wishes and continued good luck to you!